– What technical features have they used? Eg. Camera angles, movements, pace of editing, sound used etc. – They used lots of wide shots; the pace of editing was good. It used lots of fading effects to move onto the next scene. – Any changes you would advise them to make? – There is a blank screen that last for 15 seconds, I’m not sure if he has done this intentionally or he is trying to put more footage. There are a few cuts in-between and you should keep the bits when Hugo is answering the question to his Dad, which I think needs more work with. As a little note, I think you could add some music in the background but I understand it is not complete yet. The picture below show some of the paper work, notes, and feedback that I have used in the making of my One Show production. The first picture is a Risk Assessment and a Schedule. The next two pictures are from our Script outline. 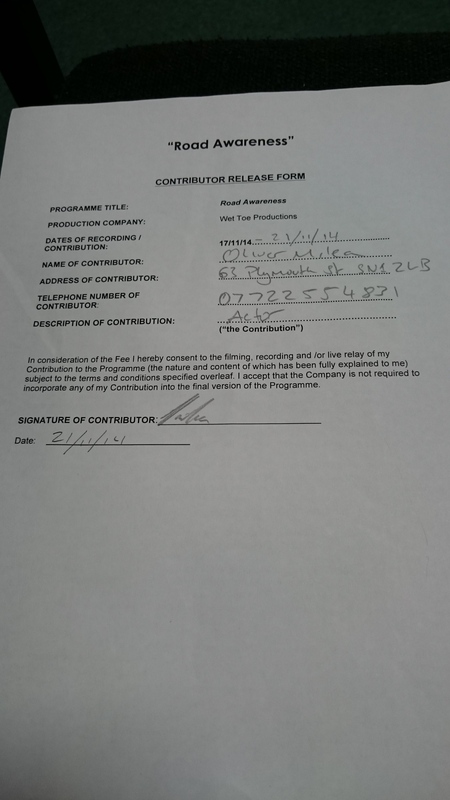 Then there are picture of the Release Forms that our contributors signed. The last two are notes and feed back that I used to improve my production.